Rhubarb is one of the earliest vegetables on the table of the cottager. This product successfully replaces the berries and fruits. It contains rutin, pectin, ascorbic acid, sugar, malic and other acids. 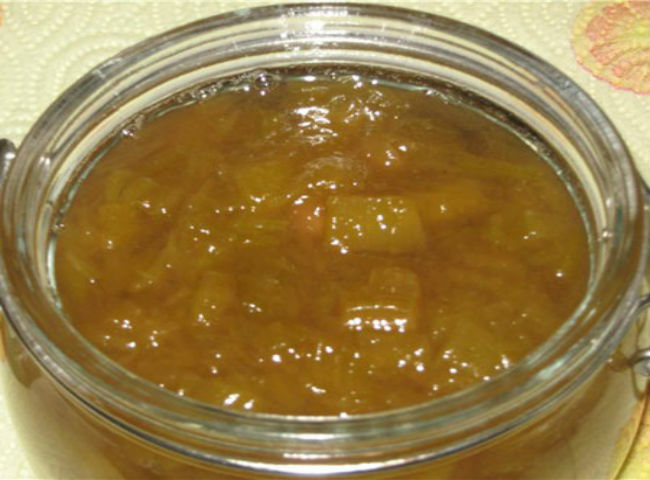 From the fleshy stems of the plants can be prepared in an excellent dessert - delicious jam. If you are going to cook a dessert of rhubarb, remember that it does not fit iron cookware. Before cutting the stalks, wash in cold water, dried and removed the covering fibrous strands. Take 1 kg rhubarb stalks, 1 l of water, 1.5 kg of sugar and a piece of cinnamon. Wash the petioles spring collection and remove the skins. Cut into pieces 1 cm long and place in boiling water and then cool, spilling cold water. When the water has drained, pour the hot sugar plant syrup. Simmer 3-4 hours by way of multiple cooking. Just before serving, add cinnamon. Pounds sliced stalks of rhubarb pour half of sugar. Leave for 8-10 hours, so the product has singled out the juice, and the sugar is dissolved. Drain syrup, bring to a boil and, stirring, dissolve in it the rest of the sugar. When the syrup comes to a boil again, place the rhubarb. Bring the mass to boil and leave. After an hour, bring to boil again and simmer for five minutes on low heat. 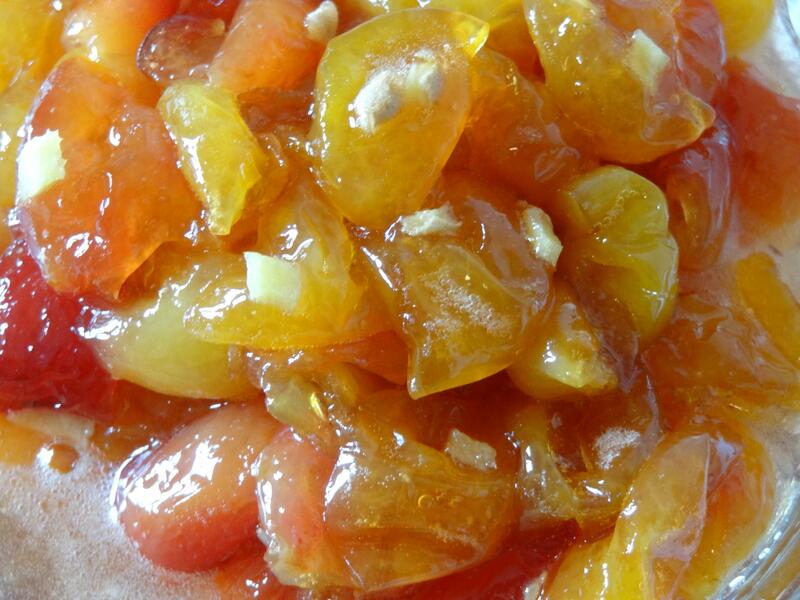 Add the jam, orange or lemon zest to enhance the flavor of the jam. Then immediately pour the jam into sterile jars, roll up, then put the jars upside down until cool. Take 1 kg rhubarb, 1 kg of sugar, 200 ml water, 100 g cherry leaves. Wash the young rhubarb stalks and cut into pieces of such length, which is equal to the width of petioles. Cook syrup from sugar and Cup of water, adding 50 g of leaves of cherry. When the sugar has dissolved completely, remove the cherry leaves and pour the boiling syrup slices of rhubarb. Cool the mass, add the remaining 50 g of fresh cherry leaves, heat to a boil and simmer until the syrup becomes thick and transparent stalks. Raspakujte the hot jam into sterile jars, roll up. In most cases, rhubarb is used for making various compotes or as a filling for sweet pastries. However, it should be noted that from this remarkable plant can also make an amazing jam. Due to its unusual taste with a pleasant acidity, rhubarb pairs well with other fruits and berries. This version of making jam can be called a classic. Cherry leaves give this treat a rich taste and exquisite aroma. The stems of my rhubarb, peeled and cut into small cubes. Cherry leaves wash thoroughly and boil them in sweet water. When the liquid will become thick and viscous mass is extracted from all the leaves. The resulting syrup, fill the pieces of rhubarb and give it a little brew. Then again add cherry leaves and place the paste on the fire. 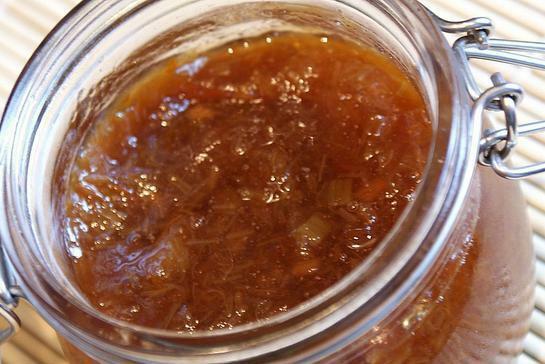 The jam will be ready, when the mass thickens and rhubarb becomes soft and transparent. Before you pour the treats on the banks, it is necessary to take out all the cherry leaves. For this recipe can use both fresh and frozen cherries. If you want the taste of the jam can vary, adding a bit of clove or brandy – it will give the dessert spicy notes. Cherries wash and remove stalks, then put into the pot, fill with water and add the sugar. Saucepan put on a small fire and bring to a boil. The stems of my rhubarb, peeled and cut into cubes small size. Spread the rhubarb in a pan to a tree and cook on a medium heat for 30 minutes, then added 1 package of pectin powder and continue to cook until until the mixture thickens. Give the finished jam to cool a little, then Packed it on the banks. Use the recipe for the ginger root will not only give the jam a specific tart taste, but will make the treat even more healthy. Rhubarb cleaned and cut into small pieces, put them in a saucepan, place the sugar and fill with water. Put the container on the fire and bring the liquid to a boil. Ginger root peeled, grate and add to the pan to rhubarb. When all ingredients are soft, remove the pan from the heat, let cool and pour the jam on the banks. 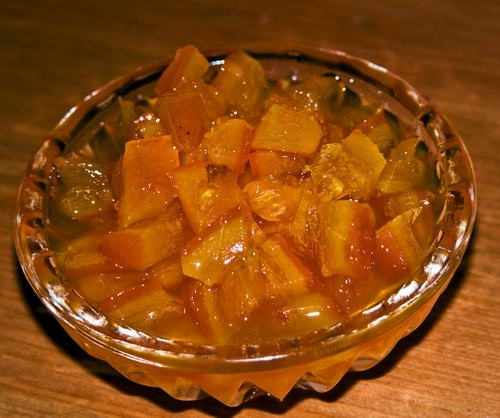 The originality of this jam lies in its unusual taste and similar to a jelly consistency, so it can be eaten as a separate dessert. First processed and shred the stems. 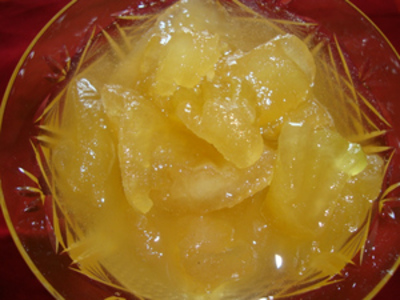 Cut pieces of rhubarb and canned pineapple put into a saucepan, place sugar and add water. Boil the mass for 10 minutes, while continuing to interfere, to avoid burning. Remove the pan from the heat, add it to dry strawberry jelly and carefully mix everything. 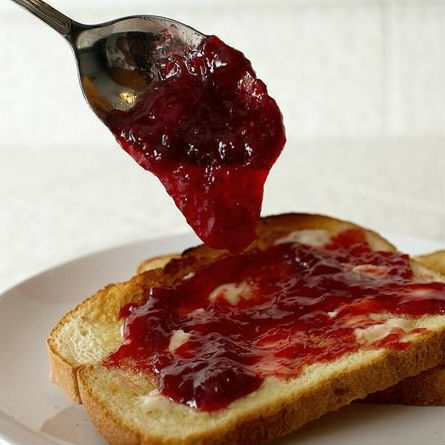 Ready jam spread on banks and sterilize them 10-15 minutes to dissolve the jelly powder. The lemon used in this recipe, not only will soften the pronounced sweetness of the rhubarb, but also highlight the taste. During cooking, the lemon can be handled in different ways: some people prefer to use citrus with peel, who, on the contrary, pre-cut skins or add in a jam shabby zest. Cut into cubes and peeled rhubarb. Sugar pour into a saucepan and dissolve it in water, then put the pan on the fire and cook until thick. In the resulting syrup omit the rhubarb and tormented jam on a slow fire until a light foam on the surface, then remove the pan from the heat, wrap it up with a blanket and allowed to infuse for several hours. In the present mass add lemon zest. Put a pot of jam on the fire and cook until the foam. Ready to give the treat to cool slightly, then pour it on the banks. This delicacy is not only for its distinctive taste, but rather high content of various vitamins and healthy substances. The treated stalks of rhubarb and cut them to pieces. Blueberries my and iterate. Orange zest puree them in a blender or wipe through a sieve. All the ingredients put in the pot, fill with juice and water. Put the saucepan on the fire and bring the mixture to a boil, then diminish the fire and tormented for jam for 40-45 minutes. Ready jam is cooled, spread on banks and preserve. 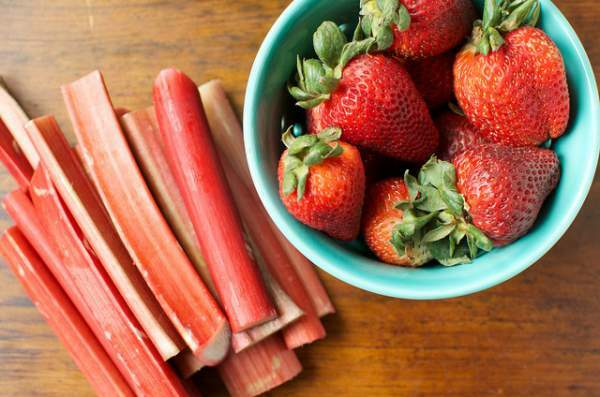 The combination of rhubarb and strawberry is considered the best for jam. Rhubarb you'll be sour and tart taste and the strawberry is sweet. Rhubarb stalks washed, peeled and cut into pieces. Strawberries wash, sort, cut into slices and put in saucepan. Put the rhubarb in a separate bowl, place sugar and leave to infuse until then, until he let the juice out. When the rhubarb will emit enough liquid, add the strawberries and cook a lot about 30 minutes on low heat. Remove the formed foam, pour in the freshly squeezed lemon juice, mix thoroughly and tormented a lot for another 5 minutes. 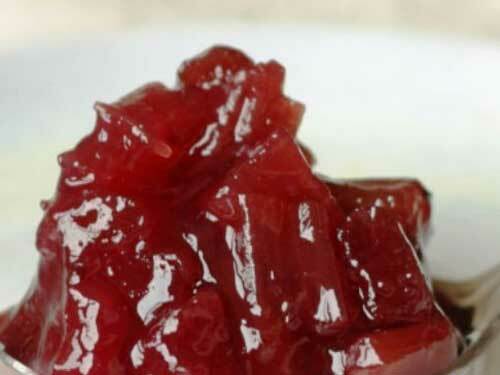 Ready-made rhubarb jam and strawberry spread on banks, cover with lids and wrap it up. Bananas give this delicacy a delicate taste and unique flavor. You only need to use ripe bananas, as only through such fruit the consistency of jam takes an amazing softness. 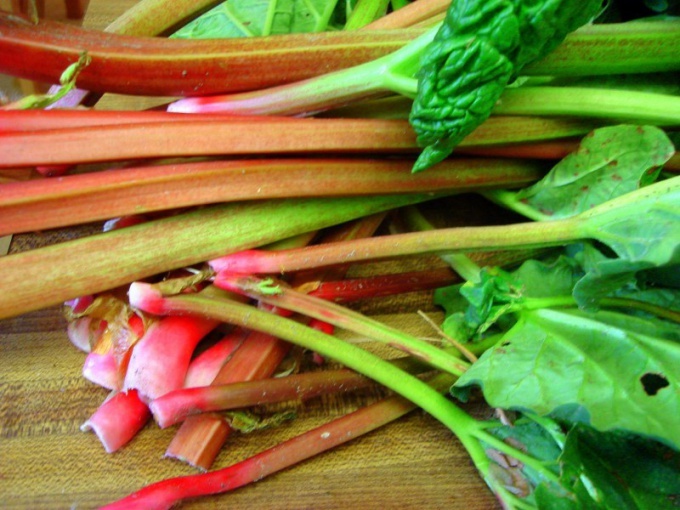 Rhubarb stalks are processed and cut into small pieces, then put them in a bowl, place sugar and leave to infuse for 3 hours to release the juice. Remove bananas from peel and cut them in slices and add to the pan to rhubarb. Cook the mass over low heat for about 5 minutes, while constantly stirring and removing the resulting foam. The dessert is ready spread on banks and wrap it up to cool. 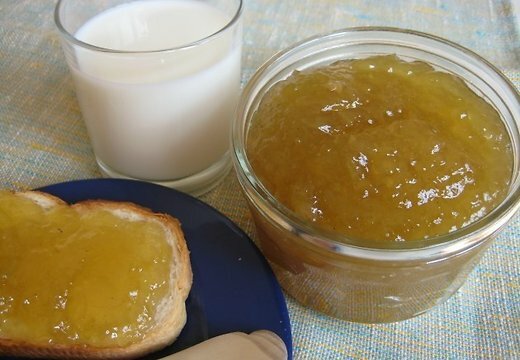 To prepare jam, which would be consumed by diabetics, is not so easy. Because not all berries and fruit will have a pleasant taste with no added sugar. In this case, a great solution for diet dessert can become a rhubarb jam and kiwi. Remove the skin from the rhubarb and cut it into small pieces. 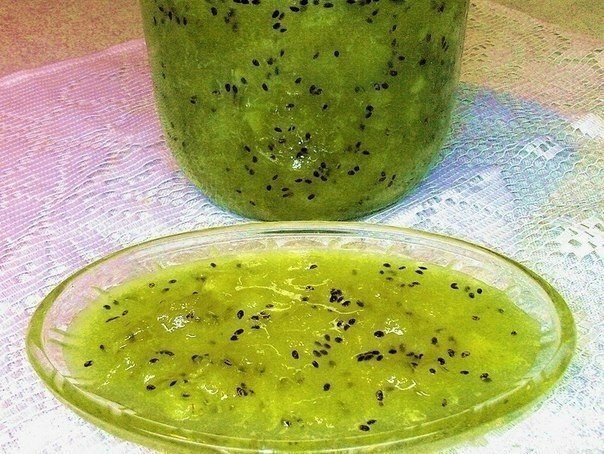 Clean kiwi from the skin and cut into small cubes. Put chopped ingredients in a saucepan, place the fruit with sugar and add gelatin. Put the saucepan on the fire and cook the mixture for 2-3 minutes. Ready a dietary delicacy spread on banks and preserve. Diet this jam is considered to be due to the small content of sugar. If desired, this recipe can be slightly modified by adding pears, plums, cloves or cinnamon. Rhubarb stalks treated and grind. Apples peeled and cut into small slices. Melt the butter in a deep and wide frying pan, then put to it chopped apples and rhubarb, place all the sugar and stew for about 7-10 minutes. In the resulting mass pour in the wine and simmer for another 10 minutes, then add the coriander. 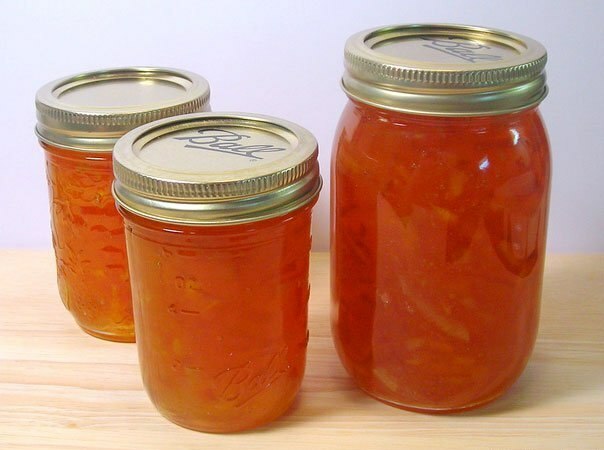 Next, you need a little then jam on low heat until all ingredients are soft and will not evaporate excess fluid. The dessert is ready Packed for banks and preserve.